A poet, a gangster and an agent of the Resistance; ‘Deserter’ details three astonishing lives shaped by the decision to flee during WWII. During the Second World War, the British lost 100,000 troops to desertion, and the Americans 50,000. Commonwealth forces from Canada, Australia, New Zealand, South Africa and Britain’s colonial empire also left the ranks in their thousands. But, surprisingly, only one WWII deserter was executed for his crime. 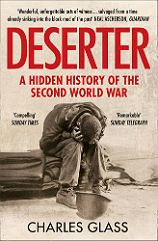 In ‘Deserter’, veteran reporter and historian Charles Glass gives voice to the powerful stories of three soldiers, two Americans and one Brit, who all ran from the conflict to meet with distinctly different fates. He follows each into the heat of battle, exploring the pressures that formed their decisions and the lasting impact of their choices. The result is a highly emotional and engaging study of an under-explored area of World War II history. Find out more on the HarperCollins website.